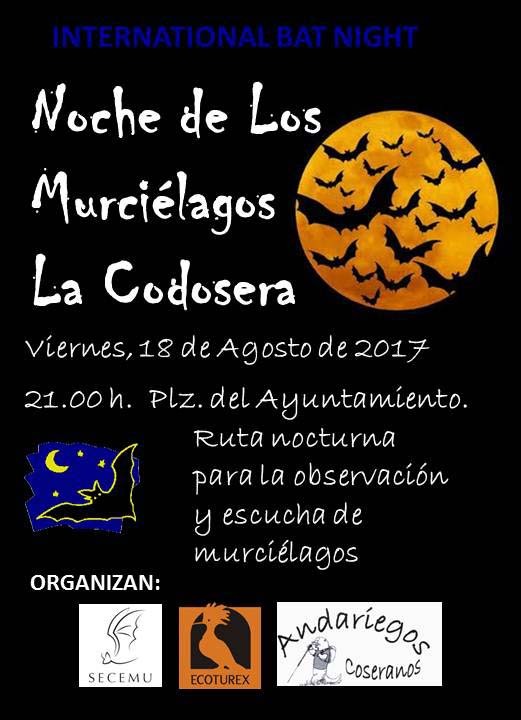 Los compañeros de Ecoturex y SECEMU nos ofrecen este viernes 18 de agosto de 2018 una Noche de los Murciélagos en La Codosera (Badajoz) en la que hará una ruta nocturna en la que se verán y oirán murciélagos gracias a detectores de ultrasonidos. Se trata una noche dedicada a los murciélagos en toda Europa y -desde hace un par de ediciones-, en otras partes del mundo (antes se llamaba noche europea de los murciélagos, y ha pasado a International Bat Night). Hay una fecha oficial, a finales de agosto, pero tambíen se llevan a cabo en otras fechas, cómo la que nos ocupa de Extremadura. El libro de resúmenes se puede descargar aquí. Desde Murcielagosymas no hemos podido asistir pero hemos recopilado algunos resúmenes que nos han llamado la atención o que son más afines a las nuestras líneas actuales de trabajo. Hay muchos más, todos muy interesantes. Bats are ideal hosts for a number of specialised arthropod ectoparasites, such as mites, ticks, fleas and flies. Their most specialised ectoparasites are the hippoboscoid flies, mostly flightless flies occurring only on bats. Throughout their blood-feeding, these ectoparasites are able to transmit a number of pathogens, and are known vectors of a number of viral, bacterial or protozoan diseases. Among these, a wide variety of bacteria of Bartonella spp. are known to parasitize bats and their ectoparasites. The aim of the present work was to assess, by PCR and sequencing, the prevalence and diversity of Bartonella spp. in hippoboscoid flies of bats occurring naturally in Hungary and Romania, and to find factors contributing to the high diversity recorded. In order to achieve this, we made molecular identification of Bartonella sequences from parasitic flies and compared them to sequences deposited in GenBankTM and evaluated the importance of host and vector ecology for the presence and prevalence of these bacteria. In our study 158 bat flies tested positive for Bartonella spp. DNA (29.1%). Bartonella spp. sequences were identified in 8 out of 10 Nycteribiidae fly species, collected from 11 out of the 14 bat species studied. Polyxenous bat flies had the lowest prevalence. Individual nycteribiid fly species explained the distribution of Bartonella spp. only marginally; with only 4 species contributing significantly to the observed pattern. Bat host species explained most of the variance found in Bartonella spp. distribution, with 6 individual species significantly contributing to the modelled distribution. Bat gender was another significant factor, with males carrying more than twice as many Bartonella-positive bat flies than females. The bat roost site also made an important contribution, as significantly higher number of Bartonella-infected bat flies were collected on bats using underground shelters, than from bats roosting either in buildings or in trees. JUAN T. ALCALDE1 **, MIKEL ETXANIZ2 , ESTELA RUIZ DE AZÚA2 , NEREA AZPEITIA2 , ALBERTO LUENGO2 , IÑAKI MARTÍNEZ1 , **jtalcalde@gmail.com 1Spanish Association for the Study and Conservation of Bats, SECEMU, Spain; 2Ekoetxea Txingudi - Plaiaundiko Parke Ekologikoa. Irun, Gipuzkoa, Spain. Nathusius’s pipistrelle is a long distance migrant species, although sedentary populations are also known. In the Iberian Peninsula it is a very rare species: most of the data come from isolated individuals found in autumn or winter and are attributed to migrant specimens, but so far, their movement patterns are unknown. However, on the Mediterranean coast (NE of the Iberian Peninsula) there is a small resident population, which in summer only hosts males. In the last two years observations of this species have been collected in two bat boxes located in the Bay of Txingudi (Cantabrian coast). Both males and females have been identified, and their presence has been verified for 8 consecutive months, from the end of August to the beginning of May. Only in the warmer months does it seem to be absent from the site. MARGARET M. ANDREWS1 **, AMELIA M. HODNETT2 , PETER T. ANDREWS3 , **mmandrews37@gmail.com 1 Liverpool John Moores University, Liverpool L3 3 AF, U.K.; 2Gavia Environment, Perth, PH 1 3FX, U.K.; 3Department of Physics, University of Liverpool, Liverpool L69 3 BX, U.K.; deceased. Ultrasound calls of infant greater horseshoe bats (Rhinolophus ferrumequinum) and lesser horseshoe bats (Rhinolophus hipposideros) were recorded from birth to 27 days of age in two separate roosts in Wales in June and July using a time expansion bat detector modified for 24 hour recording periods. The ultrasound social calls of adult greater and lesser horseshoe bats were also recorded in the two nursery roosts and were classified according to the frequency of the fundamental, the number and duration of the harmonics and the number of syllables in a phrase. The constant frequency (CF) or frequency modulated (FM) calls were compared with adult social calls identified previously. Although the echolocation frequencies of the greater horseshoe bats were typically 83-84 kHz and the lesser horseshoe bats 110-114 kHz the infant calls were similar. Ultrasound calls with fundamental frequencies between 15-42 kHz were identified as 7 categories of infant development calls and 15 categories of adult ultrasound calls. There were five distinct stages in the development of infant ultrasound calls recorded with the age of the infant bats, determined by forearm length. Stages 1-3 developed from polyharmonic isolation calls uttered through the mouth to attempts at echolocation and corresponded with Type A-C adult ultrasound social calls. Stages 4-5 infant calls were nasal attempts at echolocation that corresponded with Type E adult modified echolocation calls. There were no comparable infant calls to the Type D adult advertisement calls. A survey of ten lesser horseshoe roosts in Wales showed that infant ultrasound calls provide a means of identifying not only the presence of a nursery roost but the dates at which births started and infants began flying, The ideal time for static preset extended periods of monitoring would be from 20.00 - 08.00 h GMT in June and July. This ultrasound monitoring provides a simple non-invasive method of identifying nursery roosts. ANNA BATOR1 **, BARBARA GÓRECKA2 , KATARZYNA PTAK3 , KATARZYNA SIEDLECKA-KOWALCZEWSKA4 , KATARZYNA SULIMA, **mystacinaa@gmail.com 1Department of Zoology, Faculty of Biological Sciences, University of Zielona Góra, Szafrana 1, 65-516 Zielona Góra, Poland; 2BAT MOM Barbara Górecka, Poland; 3Animal Care Vet Clinic in Klodzko, Poland; 4Andi Vet Clinic in Kielce, Poland. We describe bacterial infections first diagnosed in two European bat species (common noctule bat, Nyctalus noctula – two specimens; and greater mouse-eared bat, Myotis myotis – one specimen). All animals had the same unspecific symptoms: weight loss, skin redness, skin pigmentation loss, baldness, swollen joints, weakening of the skin structure, necrosis of distal parts of tail and phalanges. All bats were diagnosed using antimicrobial susceptibility testing of swab samples. Three different antibiotics were prescribed for three different bacteria: Pseudomonas aeruginosa – marbofloxacin (two common noctule bats and one greater mouse-eared bat), Staphylococcus intermedius – enrofloxacin (one common noctule bat). Treatment was long and exhausting. Bats suffered from weakness and spot skin necrosis (marbofloksacin). We used convalescence support instant diet for cats and dogs, betaglucane, Duphalyte and probiotics. The same treatment was successfully applied to other bats with the same symptoms but without laboratory diagnostics (nine common noctule bats, five parti-coloured bats (Vespertilio murinus), three serotine bats (Eptesicus serotinus) and one Nathusius's pipistrelle (Pipistrellus nathusii). Bats during rehabilitation or living in captivity suffer from immunodeficiency, probably caused by previous malnutrition, mono diet, lack of milk antibodies (infants), stress or a combination of these. There is a clear need to include the laboratory diagnostics in the treatment and rehabilitation of bats. ERIC A. JANSEN1 , VITA J.A. HOMMERSEN1 **, HERMAN J.G.A. LIMPENS 1 , MARCEL J. SCHILLEMANS1 , MAURICE LA HAYE1 , MARTIJN VAN OENE1 , **vita.hommersen@zoogdiervereniging.nl 1Dutch Mammal Society, Nijmegen, The Netherlands. EDITA MAXINOVÁ1,2**, INAZIO GARIN2 , MARCEL UHRIN1 , **edita.maxinova@gmail.com 1Department of Zoology, Faculty of Science, Pavol Jozef Šafárik University in Košice, Košice, Slovakia; 2Department of Zoology and Animal Cell Biology, University of The Basque Country UPV/EHU, Leioa, The Basque Country. We studied behavioural and physiological features related to foraging during winter arousals from torpor in the Mediterranean horseshoe bat, Rhinolophus euryale. The observed colony hibernated in a cave located on the border between Slovakia and Hungary during four hibernation periods from autumn 2011 until spring 2015. We analyzed foraging, digestion, defaecation and microbial flora of bats by non-invasive methods from the faeces and based on morphological analysis, DNA analysis, proteonomic analysis, petrographic analysis, cytological analysis, microbiological cultivation and non-cultivation analyses and biochemical analyses of digestion enzymes. We found that R. euryale intermittently aroused during winter and produced both typical consumptive as well as non-consumptive faeces (produced after no feeding activity). This species became active and emerged from the cave mainly when the outside temperature was mild. Consumptive faeces during the winter contained only the order Lepidoptera. Non-consumptive faeces contained high concentration of inorganic material of cave origin and the virtual lack of prey indicates that drinking as well as direct sediment consumption occurred. Enterobacteria and enterococci in the faecal samples decreased during hibernation and only reached pre-hibernation numbers at the end of hibernation. There were time-dependent changes in the gut microflora and the decrease in bacterial variability was dependent on the hibernation stage. The activity of digestive enzymes (amylase, chitobiase, endochitinase, glucosaminidase) was detected in fresh feaces during the whole winter. Activity of chitinases was relatively stable during the winter, but activity of amylase was highest during late November and December. We conclude that R. euryale is physiologically ready to hunt during the winter when suitable conditions occur, but winter arousals are unlikely to be directed towards gaining energy through foraging, but more likely are aimed at active drinking.